Tofu, that quivering opaline block of soaked soybean curd, first arrived in Japan around the 12th century AD, shepherded there by vegetarian Buddhist monks from China. But in the States, it had a most unlikely proponent: Ben Franklin. In a letter written to friend John Bartram in 1770, he describes a “special cheese” made from beans he called “Chinese caravances.” Cheese not so much, special definitely—particularly our version wherein the silken cube is set afloat in a pool of chili, ginger, and soy. 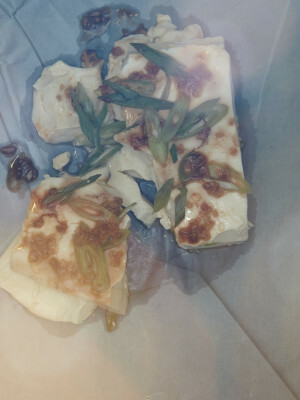 Drain tofu, cover with plastic wrap, and bring to room temperature. Sauté ginger and garlic in canola oil in a small skillet over medium-low heat, stirring, 1 minute. Add chili paste, soy sauce, and sesame oil, and bring to a gentle simmer. Turn tofu block into skillet and gently warm through, 2 minutes. Carefully transfer tofu to a serving dish and spoon sauce over. Scatter with scallions and serve immediately.